John Krasinski co-writes, directs and stars in this US horror. 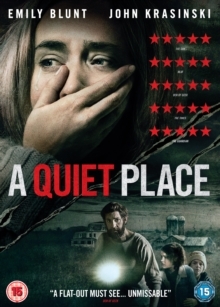 The film follows a family living in total silence in a bid to stay one step ahead of an unseen threat which hunts by sound. With his wife Evelyn (Emily Blunt) pregnant, defiant father Lee Abbott (Krasinski) is forced to go to extreme lengths to keep her and their children Marcus (Noah Jupe) and Regan (Millicent Simmonds) safe from the mysterious and deadly creatures which stalk their every move.